Jeff Koch states- "The Red Necked, Dark Red, POLLED bull we have been waiting for!! When I saw Fireball for the first time I looked at Jill and said this one is gonna be something special!! The power Fireball brings to the table is unmatched. He is big footed, huge boned, and has a tremendous amount of muscle but yet incredibly smooth jointed. What makes him so unique is how sound he is. He has a remarkable amount of flex at the ground and in his hock. He moves with ease, comfort and authority. With all that power and muscle he is soft bellied, smooth shouldered, and clean chested with a long sleek neck. Fireball is small headed which adds major value to a bull with this much power and balance for the most important calving ease traits. His mother, Pearl, has been a foundation to our herd. She is a beautiful uttered female that has been mated to several different bulls and never misses. 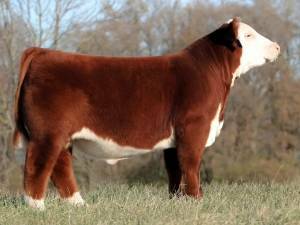 She has raised National, State Fair, and Major Jackpot Champion Steers and Heifers. Mason is certainly leaving his mark on the Hereford breed raising several National Champions. Owned by Showtime with Pugh Central Station. .